The Arch Desk ( Copyright 2014, Sebago Furniture, LLC) is designed for the writer in mind with a large work space for the tablet or laptop and has dimensions of 47" wide by 18" deep. There are six letter cubbies measuring 3 1/4"w x 4 1/2"h for your important letters and notes. Two drawers on either side of the cubbies offer a place to keep small items and measure 11 1/2w x 4 1/2"h. A top shelf 8"d x 46" wide provides space for pictures and other small items. The desk is supported by bent double arched legs and a middle arch. The piece as shown has a Curly Cherry top and walnut accents for the sides and cubby dividers. The drawer fronts are a Walnut Burl. The legs are Cherry with the middle arch being Walnut. End caps on the legs diamond shaped pieces of Wenge. The desk can be disassembled with four furniture bolts to remove the legs. 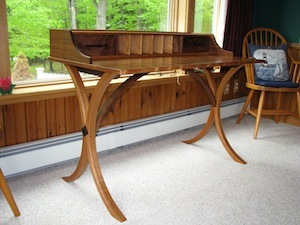 Desk as shown made from Curly Cherry is priced at $3,800. Click on the image to see other views and full size images.